You may have seen in the Daily Astorian, that the co-op is a recipient of a Pacific Power Blue Sky program solar grant worth nearly $50,000. We are thrilled! This renewable project aligns with our mission as it pertains to sustainability and generating our own electricity would allow us to save on energy costs. The grant would cover about a third of the cost to install solar panels, so in order to see it happen we’ll need additional investments. If you’d like more information, please contact General Manager Matt Stanley at matt@astoria.coop. When will the new store be open? We’re hoping sometime before the holidays! There was a great turnout at the groundbreaking for our bigger new store and the rain even held off during the ceremony. Board members, city officials, shoppers, neighbors, local officials and construction workers were all there as we broke ground with green shovels. The event celebrated the official start of construction. “The city has been instrumental in the project, including a complex land use process, getting permits on time and also decades ago having a vision to turn the closed-down Astoria Plywood Mill (a worker’s co-op), into a new mixed use development to serve Astoria,” Co-op Marketing Director Zetty Nemlowill said, as she introduced City of Astoria Mayor Bruce Jones. Jones congratulated all on the co-op team for the vision and hard work to reach this point. “As mayor there’s no more important economic development priority for me than encouraging and facilitating growth of locally-owned businesses, especially those using locally sourced materials and benefitting our community,” Jones said. Jones said it’s fantastic that those from the surrounding mixed neighborhood—with apartments, single family homes and senior living—will be able to walk to the grocery store. He then introduced our new board president, Andrea Larson Perez. “This is the culmination of five years of due diligence that has been put on by board, staff and the community. At every turn we have invited participation, received it and incorporated everything that we’ve collected from all the stakeholders. I’m so proud of our organization,” Perez said. Perez has been a co-op shopper, employee, board member, and now leads the board. Perez introduced our other board members in attendance before handing the microphone to our general manager, Matt Stanley, who she credits with working for the co-op for more than 10 years and seeing the expansion project through. Stanley said it was an awesome turnout despite the weather and thanked the co-op board, staff, city staff public officials, developer partners, and investors. The co-op raised more than $1.6 million from its owners in just eight weeks. “This is truly a grassroots project. It’s not unlike 45 years ago when a small group of people came together to build a small storefront to provide something that none of them as individuals could do. Even though we’re going to have a new and efficient building for the next evolution of the co-op, we’re still owned and directed by our community,” Stanley said. The new facility will be about four times bigger than the current store, and Stanley says it will be more accessible and welcoming, increase impact to the local economy and local food system, and improve access to healthy food choices in the region. There will be more space to shop, expanded fresh departments and a full service deli with indoor-outdoor seating, and 48 parking spaces. Stanley said R & H Construction out of Portland is overseeing the project and local contractors are going to complete most of the work including Big River Construction, Terry’s Plumbing, and Bogh Electric. The new store will result in the creation of about 30 fulltime equivalent jobs with an average wage of $16 an hour with benefits. He encouraged the community to follow the co-op’s web page for future job postings as we get closer to an opening date, which he hopes, will be in time for the holidays. Clad with hardhats and green shovels, Stanley joined board members, the mayor and city councilors and the construction superintendent to break ground. “Here we go! New food co-op, best coop on the west coast coming up,” Stanley said. The new store, an approximate 12,000 square foot building at 23rd and Marine Drive, will replace the current co-op store at 1355 Exchange. The store will remain open during construction and Stanley asked for the community’s support, by shopping and/or taking part in investment opportunities which are still available. During the event, site surveying was happening to provide data needed to start excavation and site prep on Monday, so expect to see construction as you drive by and look for regular updates on social media and our web site. Our vision for a bigger new grocery store is becoming reality! We’ll be hosting a groundbreaking ceremony Friday, January 18 at 11 a.m. to celebrate construction beginning. The 12,000 square foot new store at 23rd and Marine Drive in Astoria’s Mill Pond Village, a redeveloped plywood mill, will quadruple our retail space for added services and provide needed amenities such as a loading dock. Your co-op is a consumer-owned cooperative, governed by a board of directors and staff-run. We are a full-service grocery store and deli open to the public and known for sourcing from coastal farmers and other local producers. The additional space will broaden local economic opportunities and provide the community with more fresh, healthy food including an expanded organic produce section, meat and seafood department, ready-to-eat foods with indoor-outdoor seating and ample parking. The new store will be a half mile east from our current location at 14th and Exchange Street, which remains open through construction. “It is so fulfilling to see this vision—one that so many of us in the community have been working on—finally become a reality. We welcome all shoppers to visit us at our current location and be a part of this exciting new chapter,” General Manager Matt Stanley said. The new store is part of our strategic plan and has been in the works for about five years. The process included extensive public outreach and survey of our owners and broader community, reflecting resounding support for expansion. We raised more than $1.6 million in 8-weeks from owners via preferred shares. This successful capital campaign was instrumental in leveraging additional financing. The total project cost is about $9 million dollars, with the co-op and property owner/developer splitting the cost. For those wishing to invest, there are still opportunities. Anyone interested is welcome to attend the groundbreaking. More information about the development including construction timeline will be announced at the event. Parking is available across the street in the parking lot of the former NAPA Auto Parts. The event is rain or shine so please bring a raincoat or umbrella if needed as there will be limited tent space. We are excited to announce that building permits and external financing for the project have been secured and construction is set to begin early in the new year. Our delays this year associated with land use issues have coincided with increased costs in the construction industry. We’ve created a financial plan that accommodates for these increases and we are excited to build you what is sure to be one of the neatest food co-ops on the west coast. Stay tuned for details on groundbreaking festivities and a timeline for opening our new store! If all goes well we could possibly break ground on the new store early next year! The city council this week approved our new site plan. Your co-op altered plans to include a new access road from 23rd Street, because neighbors were concerned about the previous plan to use a more narrow street called Steam Whistle Way. Three Mill Pond residential property owners had appealed our project and even though the city council had sided with the co-op, we wanted to avoid another possible appeal. Further, as a community-owned store, acceptance from our future neighbors is important. It has been a challenging land use process, so the city manager’s positive comment is especially great to hear. We hope you are as proud as everyone on our development team to be a part of a project that’s moving forward with integrity! Now it’s a matter of finalizing plans and getting permits so we can build our new store which could be open by early 2020. Timing is in line with a goal in the co-op’s strategic plan to open much-needed bigger new store. We went back to the drawing board and have a new site plan that neighbors who had opposed the layout of our future store now support. Our expansion has been in a months-long land use process including a recent appeal by three residential property owners surrounding the co-op site. Their concerns centered around Steam Whistle Way, the street that would be used to access our parking lot. While the Astoria City Council ruled on our side, we wanted to see if we could alter the plan to satisfy neighbors, avoiding an expensive and time-consuming prospect of an appeal to the state. So in order to move the project forward we’ve worked with stakeholders to develop a new site plan that uses an alternate access to our parking lot off of 23rd street. The appellants support this option. With an agreement in place, we will return to city council to sign off on the plan at a meeting September 24. Next steps would include completing engineering of the new building and permitting. We hope to be in our much-needed bigger new store possibly as early as next year! If you have questions or feedback please contact GM Matt Stanley matt@astoria.coop. Following a grueling three-hour city council meeting, a tentative ruling came in our favor. Astoria City Councilors voted to uphold the city design review committee’s approval of our project, and reject three Mill Pond resident’s appeal. The crux of the controversy is over plans to access our new store off of a street called Steam Whistle Way. Unfortunately the co-op has not been able to find another configuration that would meet all government standards while providing the amenities that we need to operate a grocery store, including a dedicated receiving area and plenty of parking. We have attempted to go above and beyond to address the neighbor’s concerns, including widening a portion of Steam Whistle Way. The city council will make a final vote on the appeal at a future meeting. We are hopeful and working diligently to bring our much-needed expansion to fruition and will keep you up-to-date as this complicated process progresses. If you have any questions please feel free to contact our general manager, Matt Stanley at matt@astoria.coop. Read more about the meeting in the Daily Astorian article. 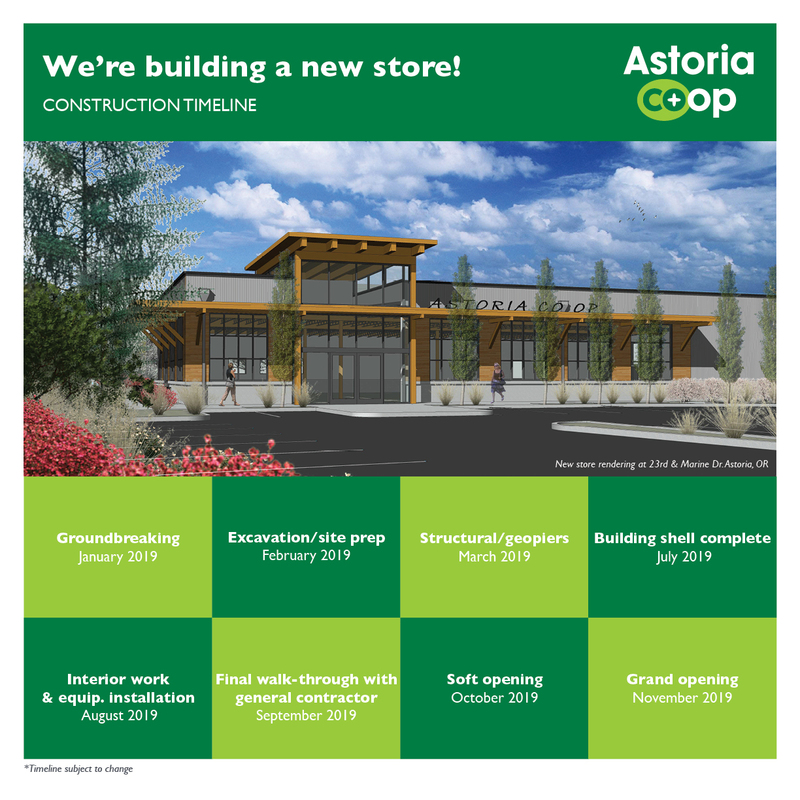 What is the plan for Astoria Co+op’s new store? The co-op plans to build an 11,580 square foot building at the corner of 23rd and Marine Drive in Astoria. It will hold about 7,000 square feet of retail space that offers a full line of fresh foods – think full-service deli, an expansive organic produce section, local meat and seafood, and more. We hope to begin construction by the end of 2018 and open in 2019. What is happening on July 30th? Astoria City Council is having a hearing to listen to some neighbors’ concerns regarding traffic behind their homes. We definitely want our co-op to be a positive impact on that neighborhood and we are optimistic that we can adequately address reasonable concerns. Is the Mill Pond Home Owner’s Association (HOA) as a body appealing the co-op’s design? No. The appeal was filed by three individual property homeowners. One of the individuals who owns a vacant lot next to the future new co-op has hired an attorney to present their appeal. The co-op’s developer partner thus felt obligated to retain representation to be sure we clearly demonstrate that our design meets the City’s criteria to the best possible standard. How much will this delay our process? Hopefully not too much. We have done our due diligence, we know this store will bring a lot of good to our community, and we appreciate everyone’s continued support! Please attend the hearing at Astoria City Hall July 30th at 6 p.m. We need to show the City Council that we have huge community support and that our shoppers are ready to shop their new store without further delay. If you have further questions please reach out to the co-op’s General Manager, Matt Stanley. He can be reached at matt@astoria.coop. The co-op’s Design Review Committee approval has been appealed by three Mill Pond residents. We will go before the City Council on July 30th at 6 p.m. at Astoria City Hall. The approval process has proved to be more challenging than anticipated. However, the greater Astoria community continues to provide us with enduring support. We remain confident that the perceived negative impact to these individuals is vastly outweighed by the benefits the co-op brings to both them and the community at-large. We will provide further updates as the hearing approaches. It will be imperative that the City Councilors and the Mayor hear from you urging them to vote to uphold the sound decision made by the Design Review Committee. Please don’t hesitate to reach out with further questions or concerns.